Meet Your Neighbor Terri Cole of Stronghurst. 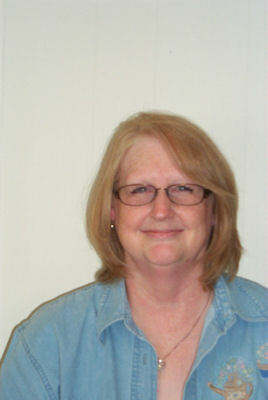 Terri is a full-time substitute cook for the 2011-2012 school year at West Central Junior High School. She previously was employed by Southern School District in the same position for 15 years before returning as a sub. After 15 years she quit to help watch her grandchildren. She was born in Galesburg and raised in Berwick. In 1979 she graduated from Roseville High School. Mike, her hubby of 33 years, is a sales representative at Cole Implement in Media. Her parents are Jeanette Jared who lives in Stronghurst at the Jarvis Senior Center apartments and Lee and Ruth Jared, residents of Abingdon. Her two sisters are Teena (Gary) Hansen of Florence, Kentucky and Tracey Jared of Pekin. Teena is a homemaker and Gary is retired from the Navy and is a contract machinist. She and Mike have a son and daughter, Bryan (Crystal), who live in Burlington, Iowa and Amy Logan lives in Stronghurst. Bryan is the manager of Rent-A-Center and Crystal is regional manager of Check and Go and Amy is a teacher at Head Start in Burlington, Iowa. Terri was very excited to tell me about her grandchildren. Piper (9), a 3rd grade student at Grimes School in Burlington, Iowa, Kingston (2), Kaylee (8), a 2nd grader and Shaden (7), Logan a 1st grader both at West Central Elementary School. She also said, "I have wonderful in-laws Chuck and Phyllis Cole." Terri has three brothers-in-law, Larry (Christene), Ed (Karen) and Don (Kathy) deceased. She is a member of Berwick Baptist Church. A special vacation was taken by their immediate family 3 years ago when they flew to Disneyworld for a week making wonderful memories to cherish. Another trip was to Blowing Rock in North Carolina with two other couples where the girls shopped, enjoyed campfires and just relaxed. When asked what she enjoyed most about being a cook at school she replied, "Definitely the teachers, and the people. Everyone is so friendly and it so much fun working with Carol Heap and Diane Renken."